Hello, dear readers. We have already looked through the add-ons for nine classes. And today we will have a look at Warlock modifications. They will suit both official servers and our uwow.biz realms. Bitten’s SpellFlash: Warlock is a SpellFlash module. It is developed specially for Warlocks. It highlights the spells and prompts you the right rotation. This modification works well with both “Affliction” and “Destruction” specializations, however it suits “Affliction” better. You can achieve high DPS by using this add-on and also learn how to play Warlock. This add-on compares DoTs on the target with the character current stats, showing the information regardless of DoTs being renewed by the player. The feature of this add-on is that it highlights the DoT icons with different colors. The color changes depending on how much bonuses your procs and buffs give to you at a certain moment. That kind of information will definitely make your game easier, especially in those specializations, which are completely based on DoTs. BadPet helps you to control your pets. For example, when you are raiding your pet will no longer attack the boss before the tank. It tracks all your DoTs and debuffs applied to targets. It has support for all classes by the way. 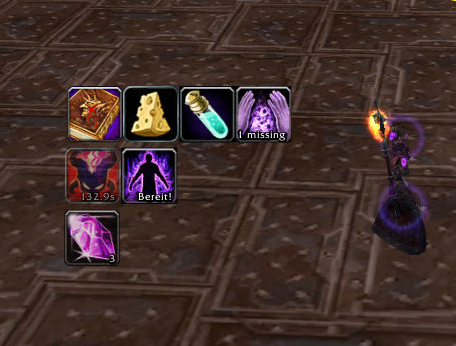 As for the “Affliction” Warlock, this add-on is extremely useful. Besides everything it does, this modification can track your pet DoTs. Ellipsis is unique since it has a wide range of options. It will be useful for both PvE and PvP, because it scans your target and makes a timer for your DoTs. This add-on reminds you of your buffs, procs and DoTs. WarlockReminder creates 4 frames, which can be customized to your taste. It’s also capable of tracking the cooldowns of “Dark Intent” and “Grimoire of Sacrifice” as well as the duration of flasks and elixirs and so much more. 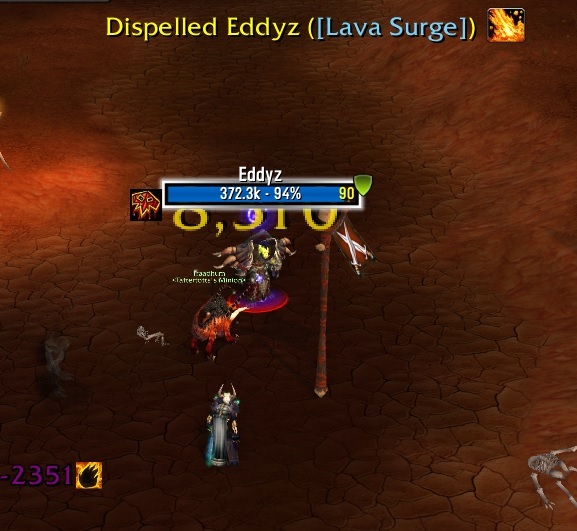 Combat reminders such as “Molten Core” proc, the amount of Soul Shards and Demonic Fury are included. Thanks to its customizability you can “force” this add-on to remind you about whatever you want. It’s a small, but an interesting add-on for Warlocks. It quotes various phrases, which are characteristic for Warlocks depending on the used ability. For example, when summoning a demon pet, your character will say the chosen phrase. It’s possible for you to pick the ready-made phrases or to make your own one. You can make phrases for each part of the day. 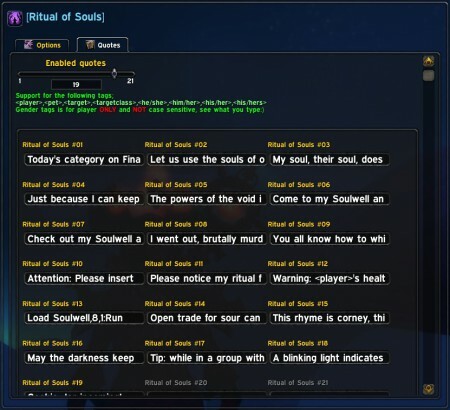 This add-on quotes on pet summoning, ritual of summoning, health and soul stones. There are phrases, which are made specially for each pet. 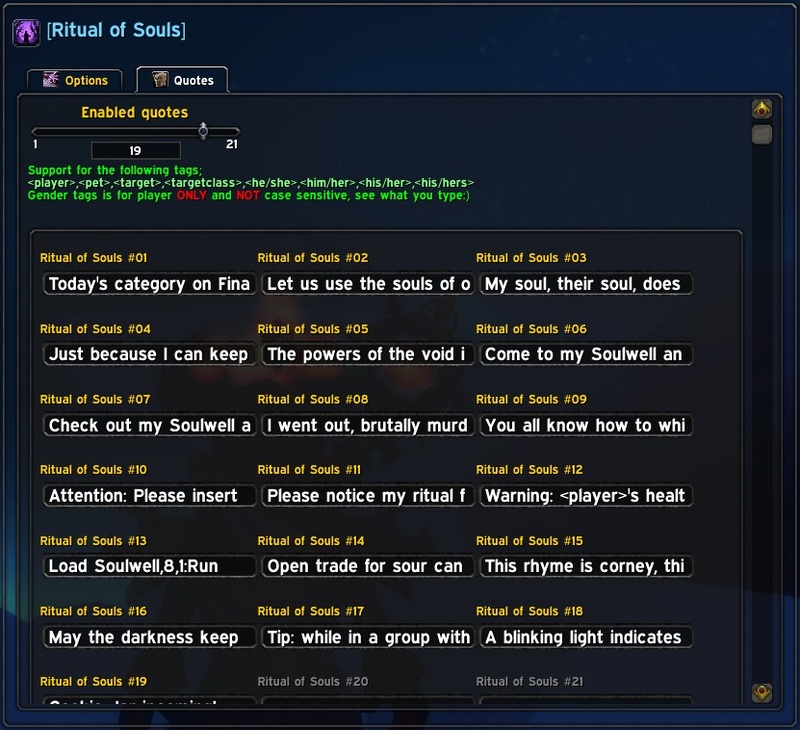 The comments are also divided into chat sections for groups, raids and solo gameplay. A large set of phrases will help you to make your Warlock unique. This special add-on for Warlocks will inform you whether you are in range or out of range of “Demonic Circle”. If your “Demonic Circle” is recharging, it will show a cooldown timer. It’s one of those add-ons, which are really useful in PvP. 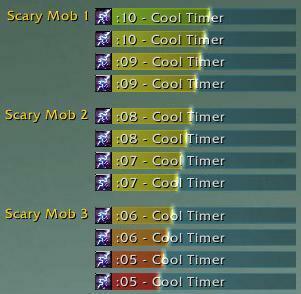 It tracks the enemy cooldowns, and also creates cooldown text logs. There is nothing superfluous in LockNotes 2. By the way, its earlier versions were for Warlocks only, and nowadays other classes can use it as well. Its main function is to time your buffs, debuffs and DoTs. It’s a pity that this add-on’s frames can’t be moved as you wish. 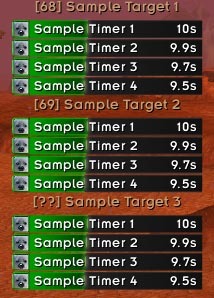 The frames show all your DoTs applied to target, and if there are more than two targets the add-on creates extra frames with DoT timers. If there are too many targets then your screen will be full of new frames, which is kind of uncomfortable. It’s quite good for 1 or 2 targets though. That’s it for our article about class add-ons: Warlock. We looked through the main add-ons in it. However, everyone can find other less popular modifications for himself. They will also make your gameplay more comfortable.